Corporate Software firm CA (I still think of them as Computer Associates, but they understandably prefer the more grownup, non-computerish name "CA") is down 4% this morning, on news that they will lay off 1,000 people in a bid to improve their competitive cost structure. Along with the layoffs, there will be about $50million in severance and facilities consolidation costs, which is causing the firm to bring down guidance for the coming year. On April 6, 2010 CA, Inc. (the “Company”) announced its Fiscal 2010 Restructuring Plan (the “Fiscal 2010 Restructuring Plan”), which was approved on March 31, 2010. The Fiscal 2010 Restructuring Plan comprises a workforce reduction of approximately 1,000 positions and additional global facilities consolidations. These actions are intended to better align the Company’s cost structure with the skills and resources required to more effectively pursue opportunities in the marketplace and execute the Company’s long-term growth strategy. Actions under the Fiscal 2010 Restructuring Plan are expected to be substantially completed by the end of the second quarter of fiscal 2011. Under the Fiscal 2010 Restructuring Plan, the Company expects to incur a pre-tax restructuring charge of approximately $50 million (including severance costs of approximately $47 million and global facilities consolidation costs of approximately $3 million). The shares were trading even lower a bit earlier, but buyers stepped in as they admired the company's efforts to bring costs more in line with the industry. 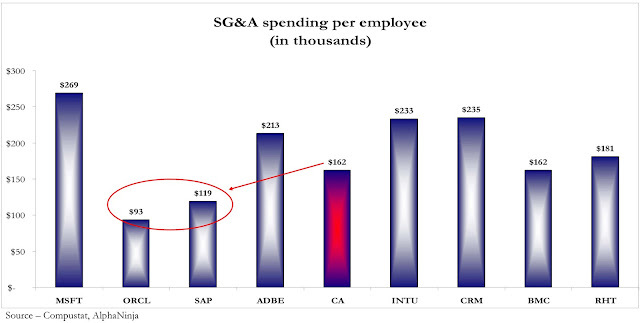 CA's Selling, General and Administrative expenses on a per-employee level look ok when compared to the broader industry, but that includes companies with "big-time" applications like Adobe(ADBE) and Microsoft(MSFT), as well as fast growers like Salesforce(CRM), who should be expected to have higher costs.